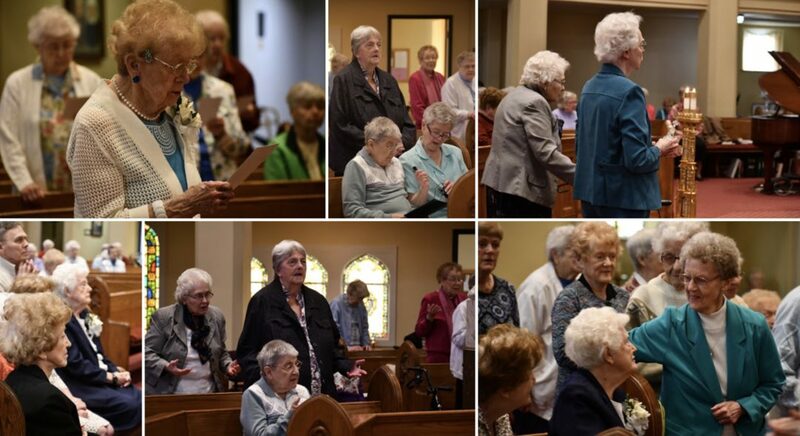 Sisters were recognized as rainbow jubilarians (those with 55 or more years as an SCN) at a celebratory Mass at St. Vincent Church, Nazareth, Kentucky. Mary Elizabeth Miller, SCN, gave the welcoming remarks in which she thanked the 15 Sisters for following their call to religious life. She shared that together these Sisters have served the Church a combined 925 years. Michelle Grgurich, SCN, offered this reflection. “’Here I am O God; I come to do your will.’ Throughout our lives and particularly as we live out our religious vocation, each day and over time, these words take on a new and deeper meaning for us. They are the centerpiece of the readings today that speak to all of us about our call to follow the Will of God in our lives. There are many moments on the journey when we encounter the profound, sacred mystery of that call, the mystery of our “yes” to God, not knowing where our “yes” to the Will of God will take us or what our “yes” to the Will of God will ask of us.” Read the whole reflection here. A reception followed Mass for Sisters, their families, and friends. Celebrating jubilees were – SCNs Evelyn Hurley (85 years), Mary Patricia Brennan (75 years), Mary Wedding (75 years), Paschal Maria Fernicola (70 years), Mary Eula Johnson (65 years), Regina Adkins (65 years), Rose Eleanor Perry (65 years), Rosemarie Kirwan (65 years), Eleanor Willett (65 years), Joan Wilson (60 years), Janice Campbell (60 years), Theresa Knabel (60 years), Rosemarie Chase (55 years), Sangeeta Ayithamattam (40 years), and Rita Davis (50 years). Congratulation Sisters. Especially Sister Regina Adkins. She was my 5th and 6th grade teacher at St. Mary School in Paris, Ky. One of the best teachers ever. Thank you for everything. Congrats SCN Sisters. We are so grateful for your service here and around the world. I remember Sister Janice when she served as the last SCN Executive Officer at STS Mary & Elizabeth Hospital in Louisville, KY.
With a special place in my heart for my Aunt Janice Campbell, I thank all of the “Rainbow Jubilee” Sisters for the blessings you bring. May you feel the warmth of our thanks and God’s love now and always. I only wish I could join you in person more often to share your joy! It was a beautiful day, a wonderful reflection and Michaella Cronin and Housekeeping made the setting so beautiful just for you Rainbow Celebrants. Congratulations, you made all SCNs proud of your service. Congratulations Sisters! I hope your celebration was fantastic. I miss these special moments with you. Congratulations on all your fine work for our Lord and Savior Jesus. Thank you dear sisters. We are with you being inspired by you all. Thank you dear sisters. We are being carried by each of you.